Whether your Company runs all four sections or one, the weekly commitment to providing a safe space where young people are learning and can be themselves is an invaluable one and makes an invaluable investment into a local community. Too often perhaps, we don’t have the time, the guidance, or the confidence to engage our wider community and this can mean that the variety, quality and potential of BB work is not fully recognised or appreciated. For example: Do people outside the Church and Company really know what we do? Do they have an understanding of our impact? We may not always recognise it, but with over 1300 Companies across UK & RoI, The Boys’ Brigade is at the heart of ‘community engagement’. In other words, we are in the business of building positive ongoing relationships to the benefit of the local community. However, is it clear who our community really is? Automatically, we may consider our ‘community’ to be along geographical lines, or just those in our membership - but its definition can be wider to mean a ‘group of people united by at least one common characteristic, including geography, identity or shared interests’. It’s important to recognise that we cannot realistically engage with all of these different groups, but appreciate that they can be relevant to what we want to achieve. Why does engaging with these groups matter? The Boys’ Brigade has always led the way to engaging the wider community – whether to partner Churches in their outreach, or to meet the challenge of a community need. By tapping into these other groups within our communities, we can add a huge boost to our recruitment efforts. Sometimes it helps to think a little ‘outside the box’ when we are looking for our next group of volunteer leaders. By casting the net a little wider, it offers the opportunity to attract a variety of talented individuals to your staff team. Also, there may also be training opportunities open to BB leaders within other organisations. By making sure that the wider community is more aware of our work and impact, it can offer a boost to the reputation of The Boys’ Brigade. It demonstrates a confidence that we are proud of what we are doing and know how much we (and our young people) make a difference. Whether it is a local school, charity or another youth group, many other organisations share similar objectives, such as supporting young people. By working together, there are opportunities for shared learning, programme development and much else besides. Community engagement also opens the door to funding from different sources – whether they be from likes of local community grants, or from running an event. How can we make the most of our community? There is definitely no one-size fits all approach here. BB Companies in rural settings, for instance, will have a very different experience to those in more urban areas. However, the approach is the same – be bold, be visible and be accessible. Ask your young people for ideas of who you could fundraise or carryout some volunteering for. Very often these experiences help build your programme too! This year members of 1st Dunbar took on some tough challenges to raise money for the Bethany Christian Trust, a local homelessness charity. 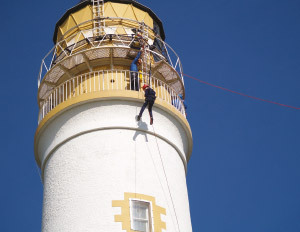 Young people completed the Edinburgh Kiltwalk Mighty Stride (a 26 mile walk around Edinburgh) and also abseiled the 37 metre Barns Ness Lighthouse. The group has raised an incredible £1000! Engaging your community also involves using tools like press and social media. Putting out a press release, or posting on the likes of Twitter and Facebook allows you to communicate to a wider audience about the BB programme, events and activities. Remember that social media is interactive and by showing an interest in other organisations, you can start to build useful connections, such as with your elected representatives, or other BB Companies. 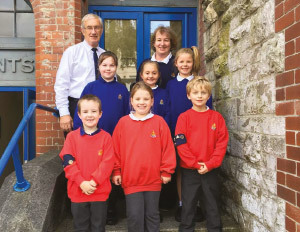 To coincide with the 4th October, 5th Plymouth had arranged that BB members at their local primary school could wear their uniform to school for a day. This not only highlights The Boys’ Brigade, but it’s a fantastic way that both school and BB can work together to celebrate young people’s achievements beyond what happens in the school day. It might be a good website, or even a banner on the side of the hall, but by being bold and accessible, the wider community is more likely to interact with BB and also recommend you! Every year Enfield Battalion gets involved in the Enfield Autumn Show to promote awareness of BB in the local community, making sure that as many people as possible know that there is a BB presence in the local community! Is there a regular local event you can get involved in, such as a fete or gala day? 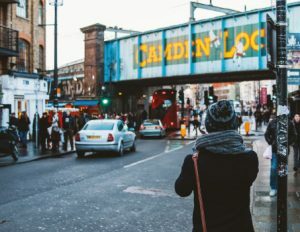 Local businesses and also supermarkets can also be a great way to build connections in the local community – the likes of the plastic bag funds and community walls can be very effective and generates a good news story too! Look at what other BB Companies, Churches and other organisations are already doing – get in touch to find out what works well and what the impact has been. You don’t always have to reinvent the wheel! Also, take a look at the community connections on your doorstep – through your Church, parents/carers and also through BB young people. This will help you develop a plan to identify which organisations to approach, what your goals are and set some realistic timescales. Support is not far away so don’t be disheartened if there are barriers in your road – speak to other Companies, your Battalion or Regional HQ about this. Or you can drop me an email to niall.rolland@boys-brigade.org.uk. Finally, it’s important to be patient! These connections will take time to develop and often the benefits will not be clear straight away – persevere, take on board suggestions and be confident in what the BB offers the wider community.